The minimum weight of the fully rigged yacht is 50 kg. B1. The boom must be made of round section straight metal tube(s). There must be a device to make it impossible to sheet any part of the boom below this level. C1. The width of the yacht should not exceed 2.00 M.
C2. The wheelbase of the yacht must not exceed 2.50 M.
C3. The chassis must be made of metal tubes, the section of which must be round, square or rectangular. Cables are forbidden, except for the stearing. C4. Fairings are forbidden on the chassis. Inside and outside wheelcovers are allowed. C5. Any wheel with wire spokes must be covered by internal and external wheelcovers. M1. The mast must be made of round section metal tube, the outer diameter of which must not exceed 60 MM. At rest, the mast must be straight. M2. The mast may be made from a maximum of four different diameter tubes, each tube must have a constant outer diameter and wall thickness over its full length. At each change of diameter, 3 CM are free to allow for chamfering or for protection of the mast pocket. M3. The mast must be rigidly supported by an arrangement of metal tubes, all not higher than 1.20 M above ground level. M4. The position of the mast must not be modifiable with the yacht in motion. M5. The length of the mast shall be such that the distance from the top of the mast to its foot plus the distance from the mast foot to the ground shall not exceed 5.50 M.
S2. The sail must be located onto the mast by means of a pocket. S3. The internal circumference of the mast pocket must not exceed 240 MM (i.e. 120 MM long when laid flat). S4. The sail must be free to rotate around the mast. S5. The mast pocket must be made of sailcloth. Stiffeners, fairings or similar devices fitted inside or outside the mast pocket are prohibited. S6. 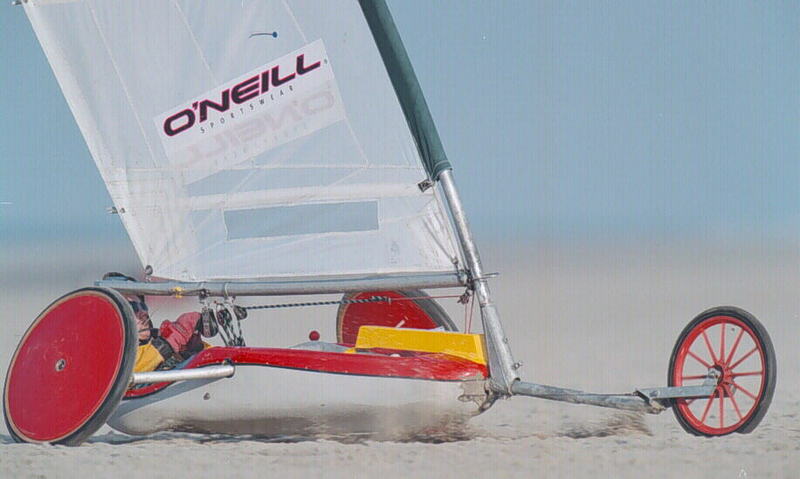 Fairings or similar devices fitted to the sail are prohibited. Batten tensioner line or leach line. S8. The maximum width of the battens is 50 MM. These accesoirs may be part of the seat. The seat may not contribute to the rigidity or the resistance of the chassis. SF2. The foot-rest should present the pilots (and ev. passengers) feet inadvertantly touching the ground. SF3. The external width of the seat may not be over 1.00 M.
SF4. The external length of the seat may not be over 2.50 M.
SF5. The front of the seat or footrest may not be further forward than the back of the mast. SF6. Fairings that form part of the seat and extend no further than the limits of the seat are permissible. The shape of the seat must be such that the pilot's body is always fully exposed when viewed directly from above. SF7. It shall not be possible to move the seat while the yacht is in motion. SF8. Any sharp edges on the yacht must be made safe.